A class that handles the analysis of uniqueness violations. Definition at line 240 of file Consumed.h. Definition at line 254 of file Consumed.h. Definition at line 257 of file Consumed.h. 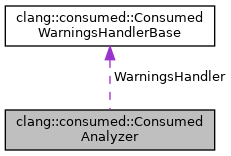 Check a function's CFG for consumed violations. We traverse the blocks in the CFG, keeping track of the state of each value who's type has uniquness annotations. If methods are invoked in the wrong state a warning is issued. Each block in the CFG is traversed exactly once. Definition at line 1304 of file Consumed.cpp. References clang::CFGElement::AutomaticObjectDtor, clang::CFGElement::castAs(), clang::consumed::ConsumedStmtVisitor::checkCallability(), clang::AnalysisDeclContext::getAnalysis(), clang::AnalysisDeclContext::getASTContext(), clang::CFGTemporaryDtor::getBindTemporaryExpr(), clang::FunctionDecl::getCallResultType(), clang::AnalysisDeclContext::getCFG(), clang::AnalysisDeclContext::getDecl(), clang::CFGImplicitDtor::getDestructorDecl(), clang::Stmt::getEndLoc(), clang::CFG::getExit(), clang::Decl::getLocation(), clang::CFG::getNumBlockIDs(), clang::CFGStmt::getStmt(), clang::CFGAutomaticObjDtor::getTriggerStmt(), clang::CFGAutomaticObjDtor::getVarDecl(), clang::Type::isVoidType(), clang::FunctionDecl::parameters(), clang::consumed::ConsumedStmtVisitor::reset(), clang::CFGElement::Statement, clang::CFGElement::TemporaryDtor, clang::StmtVisitorBase< Ptr, ImplClass, RetTy, ParamTys >::Visit(), and clang::consumed::ConsumedStmtVisitor::VisitParmVarDecl(). Definition at line 252 of file Consumed.h.